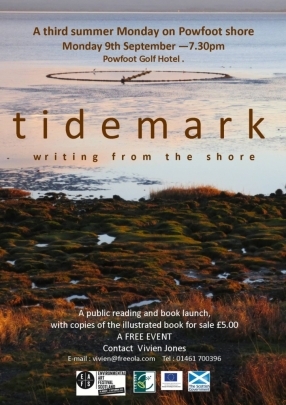 The launch will be at The Big Lit Festival in Gatehouse of Fleet on Sunday May 5th at 10.00 am at The Mill. 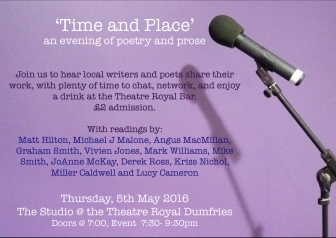 If you are a contributor come and read, collect your copy, and chat to the editors - if not, come anyway and hear some fine new work in pleasant company. 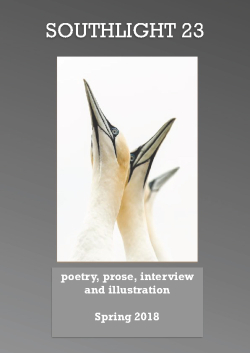 Writers and illustrators are invited to send work for inclusion in the September edition - which will be launched at the Big Lit Festival in 2019. illustrations should be black and white and with strong contrast - we do use colour images for the centre-spread and the cover. 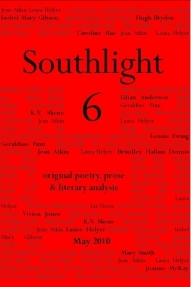 See the magazine website - www.southlight.ukwriters,net for submission details. 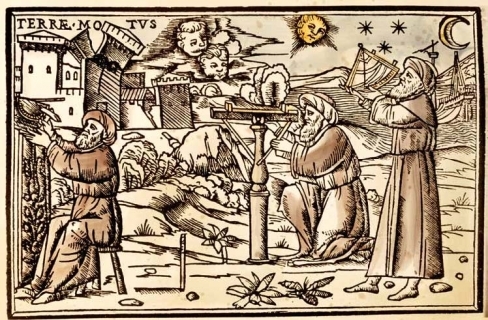 renaissance music and text in celebration of the great astronomers (and astrologers) of the 16th/17th centuries in Europe, told by the women in their lives. 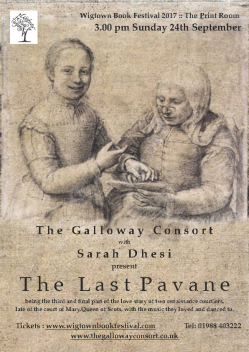 Each year I write a new performance piece for The Galloway Consort - the early music group that I play with - the text is spoken by an actor and delivered in a conversational tone so that it avoids being a dry piece of history, though it is carefully researched. This performance is the first of three on this tour - the other two are in July at the Loch Arthur Community in Beeswing and at the United Reform Church in Annan. Two short plays, take a sideways look at what happens when people ignore what’s expected of them to find their own solutions to life’s problems. Dinner at Home is about an unexpected response to a wealthy woman’s generosity. A Different Kind of Revolution shows us how a couple of frustrated activists take on a jaundiced politician and play him at his own game. no invitation to heritage angels. smear your clothes with unseen slime. to the life in and out of the water. through the air, frogs slowly blink. some purple, some bent to the water. for being still, the air shimmers. flies and mates and dies unseen. 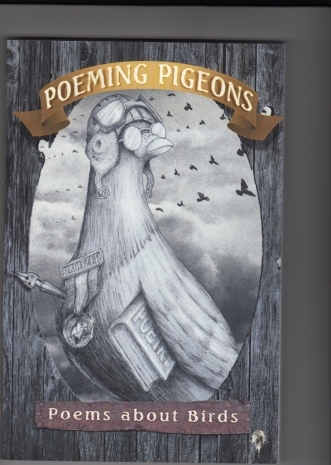 in which my poem 'Swords into Ploughshares' appears. 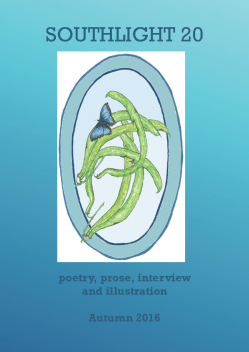 The Blue Nib - five poems in this fresh new online magazine. 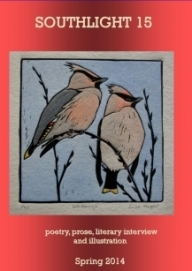 Keep-poems-alive this is Sally Evan's considered online project to re-print poems that may have slipped from memory - poems have to be at least three years old, and have appeared in print. She has chosen a number of mine over time. in this part of Scotland. 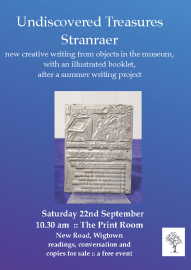 This will be a third such event, this time drawing from writers across Scotland. 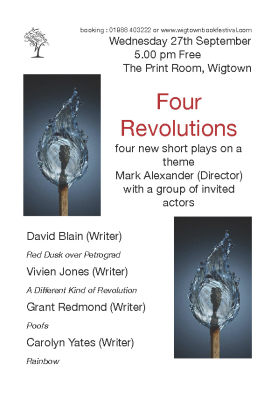 Very pleased to announce that I am one of five writers with a short play chosen for this award. Each play was rehearsed and fully staged, with opportunity for the writers to give feedback. 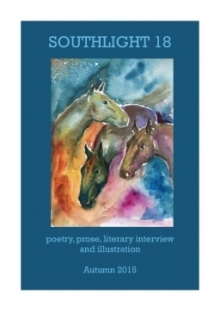 Come and meet the writers and editors, if you're a contributor to Southlights current or past, come and read.
! Livewires 2016 is Live ! 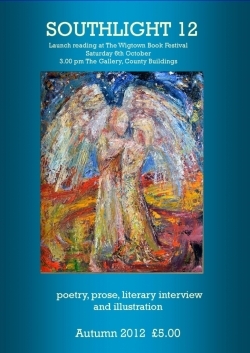 Come and meet the writers, examine the exhibits and buy the book. 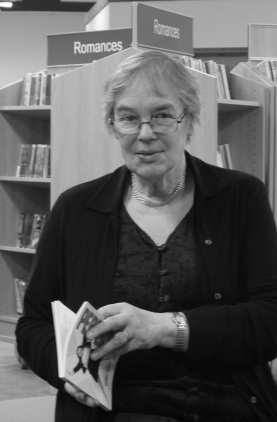 Writer Vivien Jones will lead two workshops for all levels of writers from beginners to professionals. 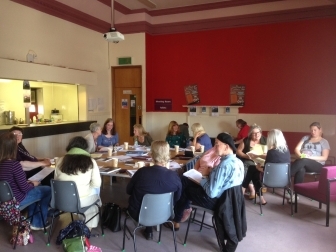 Working in small peer groups participants will support each other to produce creative writing inspired by unusual, and sometimes overlooked, objects in the museum collection. 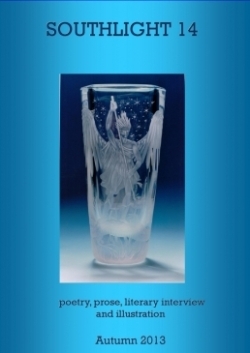 The finished work will be published in a booklet. In workshop one, participants will be paired with a museum object and guided towards available research within the museum and beyond. In workshop two, participants will bring work in draft form and work in small peer groups to share and refine their work towards publication. For further details and to book a place on the workshops you can contact Vivien Jones, telephone 01461 700396 or email Vivien@freeola.com. Also preparing my Cottingley Fairies piece (26 Lies Project) for exhibition in the Free Word Centre in London in September - has to be blown up to A1 size. Details to follow. 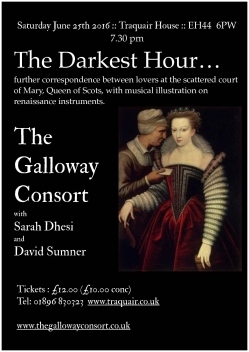 First performance of my new text and early music event went very well in the 2016 Dumfries & Galloway Arts Festival - 'The Darkest Hour' - is a correspondence between lovers at the court of Mary, Queen of Scots, illustrated with 16th century music on appropraite instruments. Next performance is at 7.30 pm on Saturday 25th June at Traquair House, Innerleithen - a most atmospheric historic property. I'm reading among many friends. 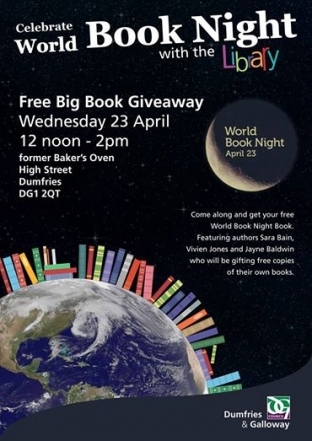 Come and join us - it's free ! 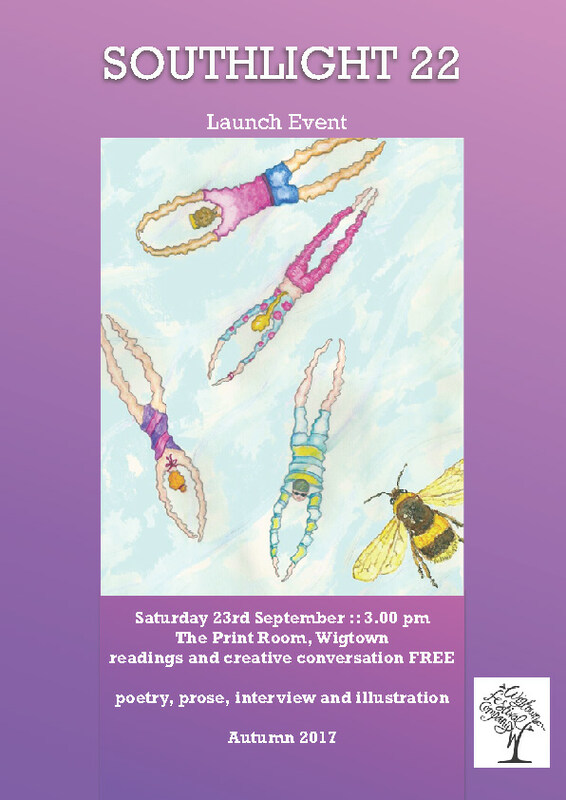 26 writers and 26 artists were given the task of responding in words and pictures to 26 Great Lies in history and literature - mine was The Cottingley Fairies, the photographic hoax (or was it?) that persuaded Sir Arthur Conan Doyle that he did believe in fairies. 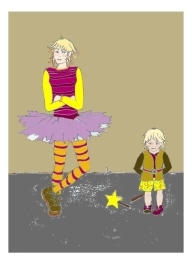 My friend and fellow writer, Hazel Lowther, created a contemporary image for my contemporary take on it. Comments welcome on the project website. The project blog with all the creation stories is online. 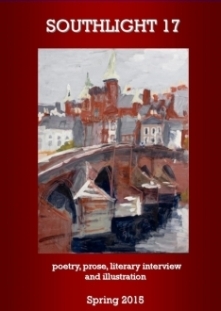 Vivien Jones lives on the north Solway shore in Scotland, and this is her second collection of poetry. Short of Breath has no overarching theme, and encompasses some subjects that are perhaps predictable, such as family snapshots, or a visit to a stately home. But here are others that take you by surprise: a child watching her father making a mysterious box; a raincoat of “shimmering emerald green” cut up and turned into a Robin Hood outfit; a sense of wonder at wood and trees. Jones has a wide-eyed interest in astronomy, and “the pounding music of the galaxies”. She is fascinated by Pluto, and its relegation to the status of a minor planet: “I am dark, / too far for light to lift / my rocky heart, / what warmth I know / is just less cold” (Pluto’s Lament’). 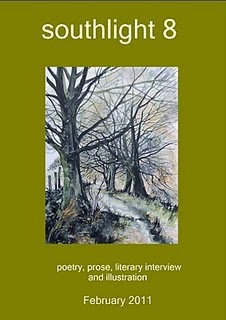 The collection includes ‘Patna to Sauchiehall Street’, reflections on a meandering bus ride through hills where “the coal’s long gone”, leaving “thin men with starved spirits” leaning against the wall of a “boarded up-institute”, and ending in a racist confrontation in Glasgow that leaves its perpetrators “secretly shamed”. and the viewing of it. Mostly we are living in the spaces between things, Jones seems to say. In Detritus, where she invites us to consider the distance between the end of a life and the extinction of its impact, which she poignantly compares to the decay of a plucked lute string. 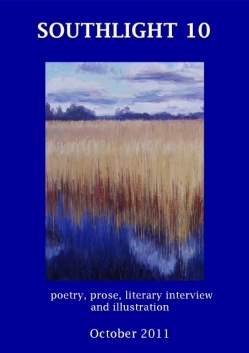 In a collection that is generous in length, and breadth of vision, Jones takes us beyond Dumfries and Galloway and rural bus rides, to Cornwall and Malta, and to the far reaches of the solar system. I enjoyed Short of Breath for its scope, humour and humanity. 26 writers were paired up to create new ghost stories,one to tell, the other to write, each tale illustrated by their own choice of artist. Mine goes live on Thursday 23rd October but there will be one a day from now until Hallowe'en. My story is called I Will Wait... and tells of a strange event in a condemned house. 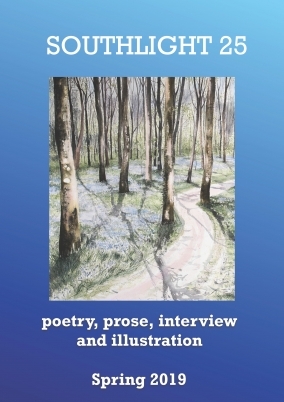 It's beautifully illustrated by Hazel Lowther, one of the Powfoot Writers. Launched with much jollity at the Market Hall in Annan. 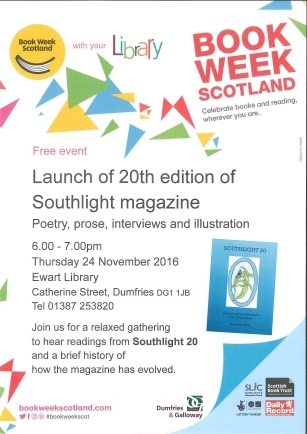 ideal opportunity to try your talents, and be published. 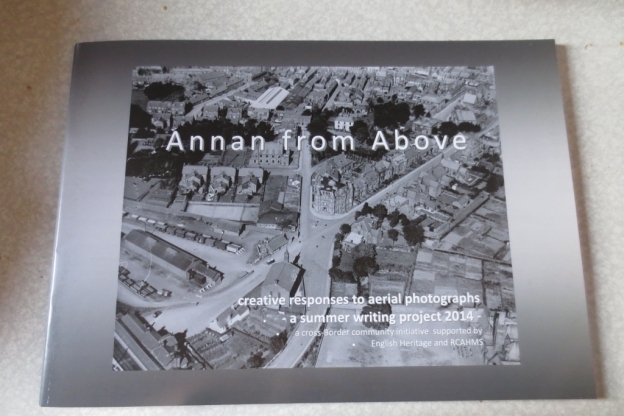 The ‘Borders’ project is looking to create new writing for a book inspired by aerial photographs of Annan. 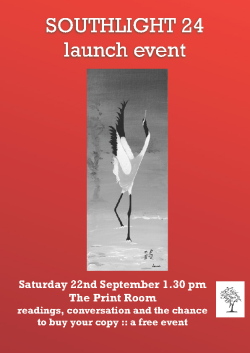 This material may appear in print, online or at an exhibition to celebrate the book launch in September 2014. Do come along to make your contribution. 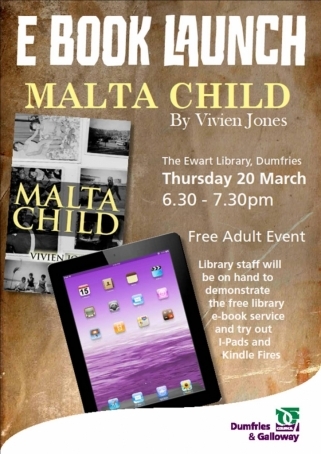 ... lovely evening at the Ewart Library, with friends and strangers and a very helpful library staff. Never seen so many e-readers in one room ! 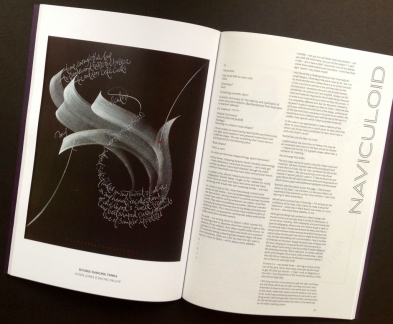 this is my page (with calligrapher, Rachel Yallop) from the exhibition catalogue. Our letter was N - our word was naviculoid which means boat-shaped. interesting to follow the threads. 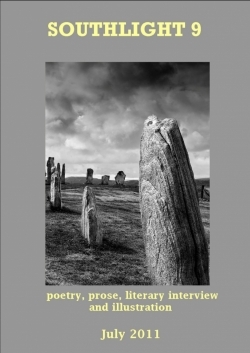 Two autumn 2013 publications from two Dumfries & Galloway writing groups. 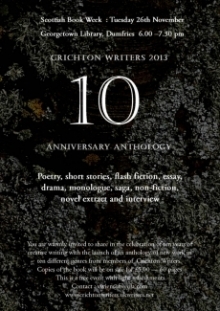 'CW10' anniversary anthology from Crichton Writers. 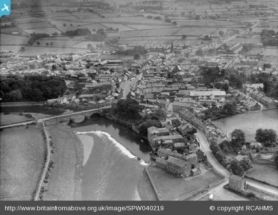 in case you're wondering, the structure in the foreground is an Edwardian high water swimming pool. talk to the writers, buy the book and discover the shore for yourself. do come and help us celebrate. After a morning of torrential rain, the skies cleared and we had a beautiful evening to roam the shore and settle to pool our impressions. One of our number delivered a fascinating 5 minute talk on the geology of the shore and we went away to start writing.....watch this space ! 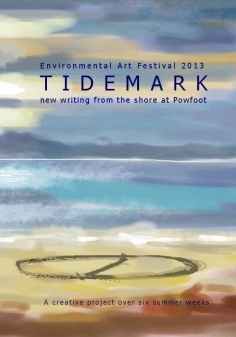 Looking forward to leading this project - two writing workshops, a publication and a public reading focussed on the shore in the village of Powfoot. Poetry and Calligraphy this time. to produce a single artwork for exhibition in London and in Europe in the autumn. All 26 letters of the alphabet have been allocated to pairs of writers and artists. I have written a double tanka for the occasion... more to follow. Both performances were sold out and very well received. fellow-musician, Laurence, died in 2011.
next performance is part of the Big Burns Supper weekend in Dumfries on Saturday 26th January 2013 at 4.00 pm in the Hopkin Room, Theatre Royal. my collection of short stories. 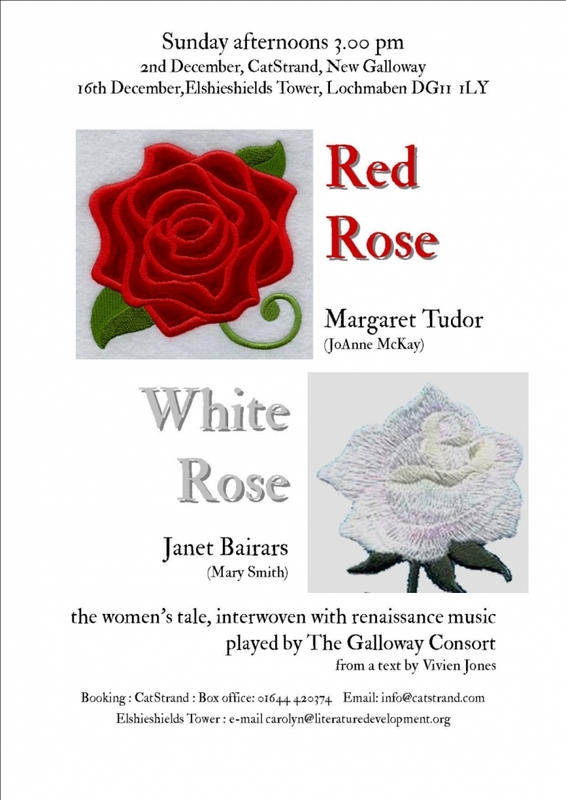 The story - the wife and sometime mistress of James IV share the experience of loving a powerful man - Margaret's currency is her fertility, Janet's her undemanding demeanour - both stand to lose much as men all over Scotland go to battle on the bare moor of Flodden with their king. In the meantime the women are comforted by music that expresses their fleeting joys and sorrows. 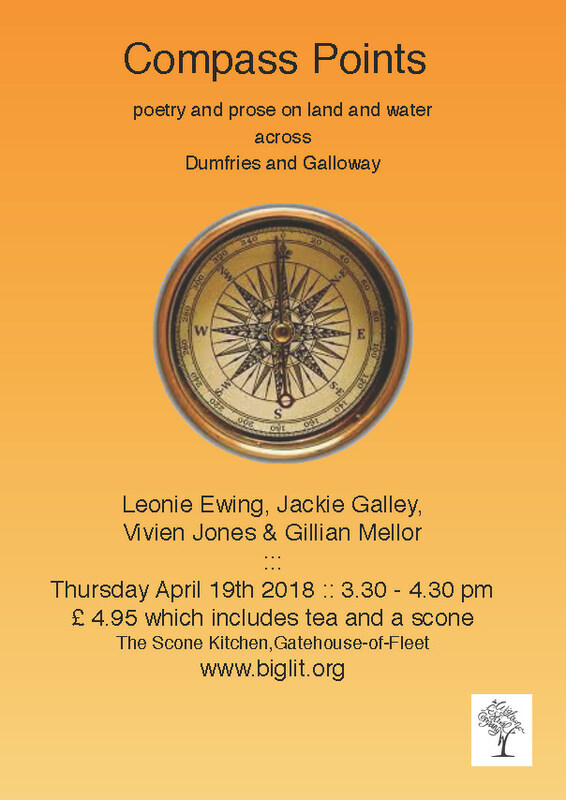 The background - this performance marks a new collaborative performance between early musicians, writer and readers resident in Dumfries & Galloway. 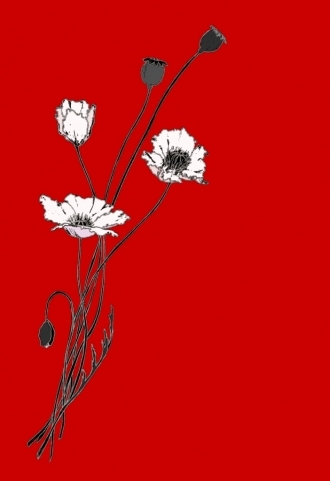 From a text based on a story in her book of short stories -White Poppies (Pewter Rose Press 2012) - Vivien Jones has created a dramatic reading of an imagined exchange between two striking renaissance women on the night before the battle of Flodden in 1513. 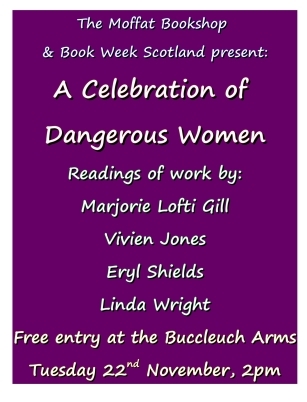 Published writers in their own right, Mary Smith and JoAnne McKay, join musicians, Richard and Vivien Jones, playing 16th century music, to tell the women's tale. The performances are on Sunday afternoons. 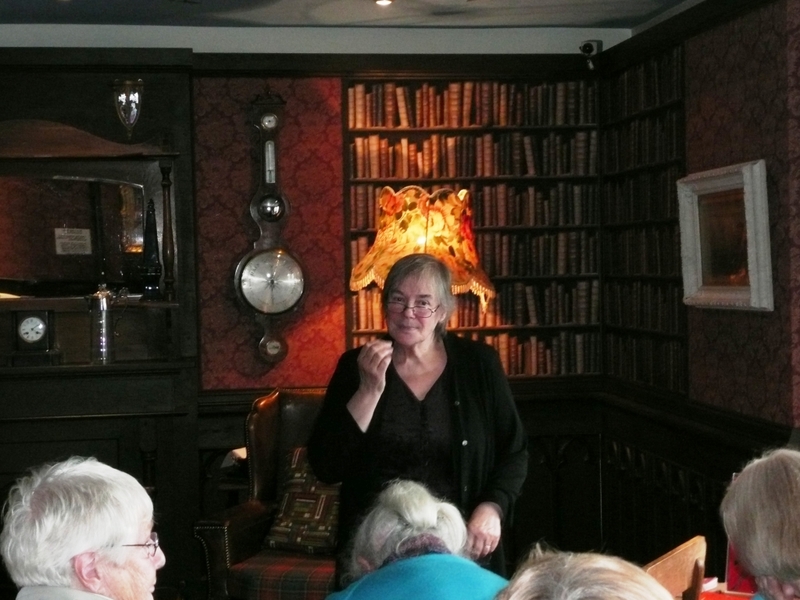 There will also be a performance during the Big Burns Supper in the Hopkin Room, Theatre Royal, Dumfries at 4.00 pm on Saturday 26th January 2013. 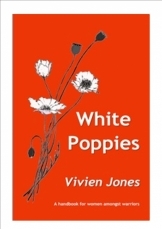 -White Poppies has been published. on Tuesday 30th October 6.30 pm. 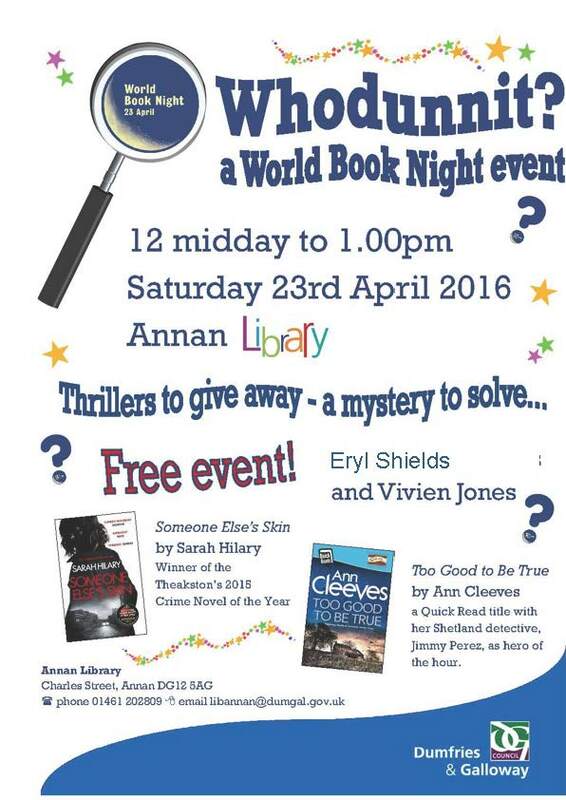 Do come if you can - it's always good to see friendly faces in the crowd. 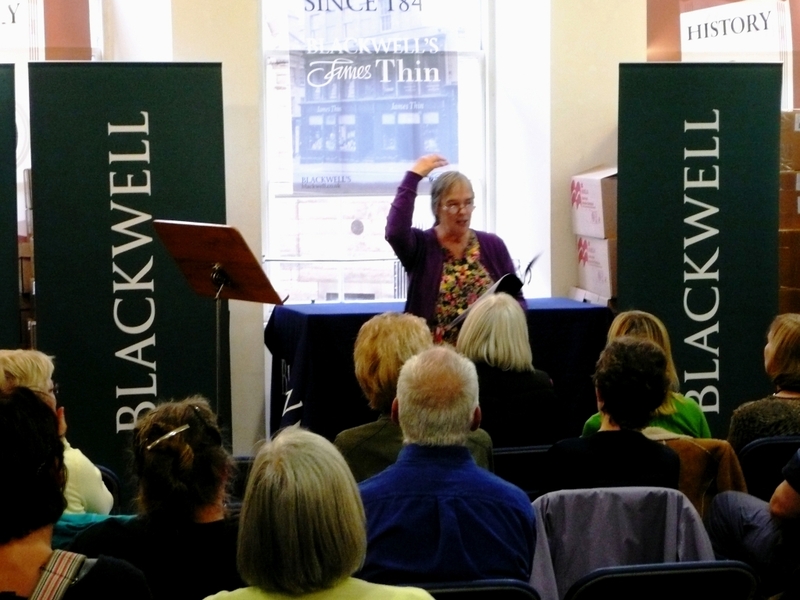 (Daphne du Maurier) There were over 40 in the audience and they nearly all stayed to chat long after the last book had been given away. and a story in the Seven Stops project for Clockworks in Glasgow - Having a Nice Day - which will be part of an anthology of stories graded by the number of stops on the Underground your journey will take - mine is a six-stop story. We didn't win but had the warmest letter of congratulation for our new project. 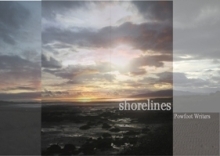 I learn today that 'Shorelines' - the book that grew out of a writing project I led here in Powfoot this summer, is one of six projects in Scotland short-listed for an Epic Award for community arts projects. Final decision in January 2012 but in the meantime, I'm so pleased for this recognition of a fine effort that was a pleasure to be part of. 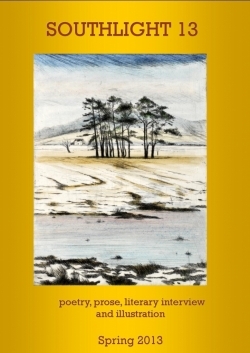 My poem ' Naiad' (from 'Writing Ground') has been chosen as the September Poem of the Month in the Scotsman by staff at the Scottish Poetry Library. It will be published on the 24th September. 'Sorting Office' has won this award. http://www.youtube.com/watch?v=7z-NZ-kY4J4 The son of my Pewter Rose publisher, Matthew McDonnell, has made a film of one of my stories from 'Perfect 10' -it's the internet romance called 'Net Babe'. He and I would love to know what you think - you can comment on this You Tube link. 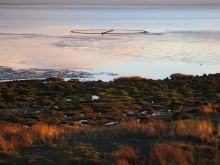 created by people who live in Powfoot. One week after the launch all the first 100 books were sold and we had to re-print to meet demand. Creative Scotland (formerly The Scottish Arts Council) has awarded me a Writer's Bursary for my next major writing project - a collection of monologues and short fiction on the theme of women amongst warriors - to be completed within the coming year. 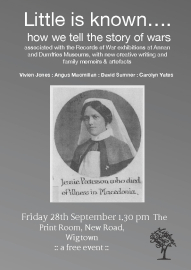 This work will be drawn from anecdotal material from my parents (both in the Royal Navy) my own history in various protest movements and material from various war diaries written by women. 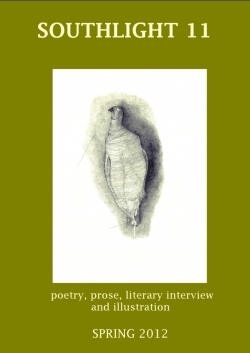 I have won the 2010 Poetry London Prize. 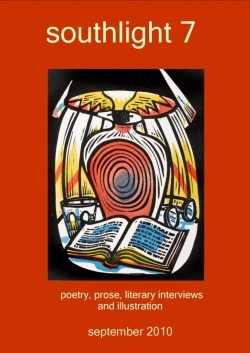 I read the winning poem - 'My Mother's Literature' at the launch of the magazine on October 13th at Foyles,Charing Cross Road, where I will also receiveed the cheque for £1000 from the judge, Michael Longley. Very encouraging to see piles of my poetry collection 'About Time, Too' on sale in this top book shop. I have lived and worked in Scotland for forty five years, working in alternative education until the closure of a school put a temporary stop on my career as a teacher. 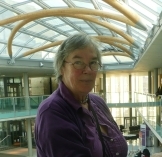 I was a mature student at the Crichton Campus of the University of Glasgow in Dumfries where I took a Creative Writing course (part of my MA Hons degree) under the direction of Tom Pow. In the last ten years I have been writing in all the genres that I once taught to others. I am also a founding member of the renaissance music group, The Galloway Consort. 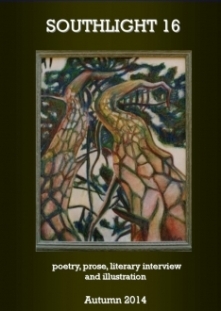 I am a writer of prose, drama and poetry, which I also perform in readings and collaborative events with musicians. 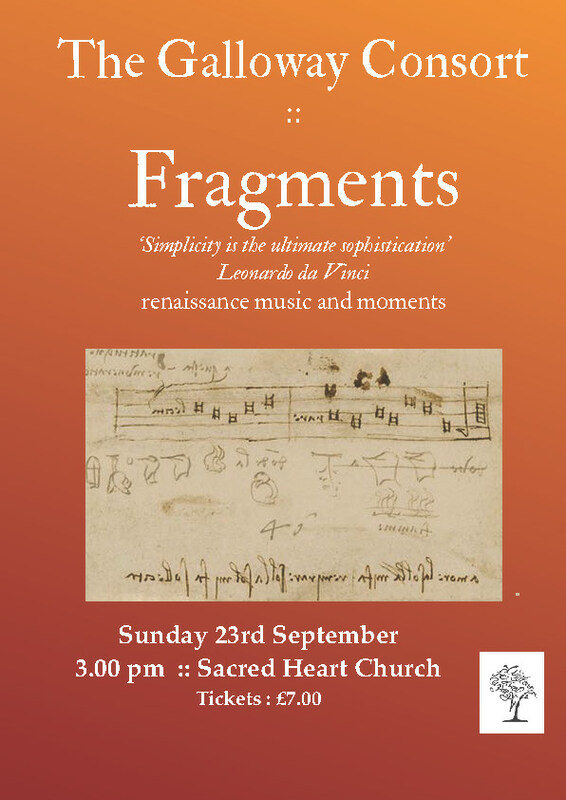 I have a particular interest in renaissance themes which have formed the basis of several performance events including site-specific dramas in historic locations. My prose work is in the form of short stories which explore the small rebellions in everyday life that sustain a sense of individuality, particularly in the lives of women. 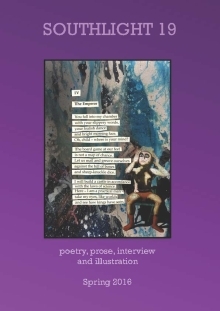 The themes of my poetry are domestic; rituals of family life, the association of food and nurture, the experience of making and hearing music, and latterly, work on environmental themes. I have a strong interest in presenting the written word to live audiences and have created collaborative events with musicians that have seen successful public performances including a performance event in 2007,‘Making Waves’, with all the texts printed into a chapbook, which featured new writing on watery themes with music inspired by texts written by Jackie Galley and me. 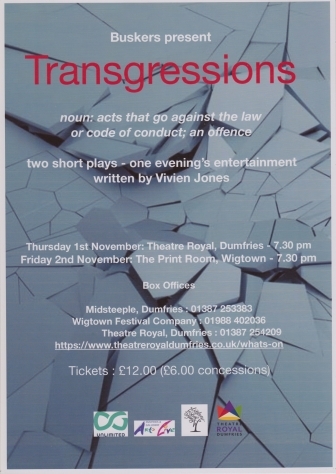 The same group, friends as well as writers and musicians, has developed a new programme,’Tree’, which has had performances at the Wigtown and Sedbergh Books Festivals in 2009. 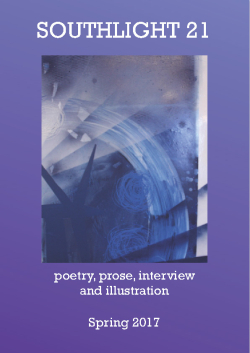 In 2008 I worked with three other writers and two artists to create Soundscapes, an exhibition and reading sequence that was staged twice in the GaelForce Festival of the Arts and which also produced an illustrated chapbook. 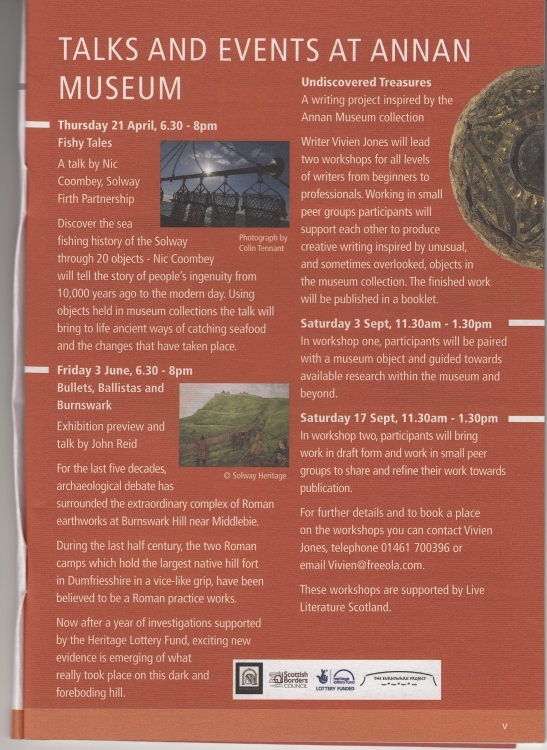 In 2009 the same group have produced a similar event in association with The Great Wild Goose Chase, also with a chapbook. I am always willing to discuss new collaborative projects with other writers and artists.I am available to do readings and creative writing workshops, especially for those new to the writing process. ‘ Her humorous, almost misleadingly gentle performance was obviously appreciated by the audience, who were then provoked to laughter by unexpected mischievousness –“gorse is a feast, a binge/ a prick of a shrub' Jean Atkin. 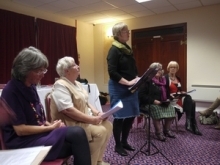 DGAA reviewing 2007 Poetry Double performance. 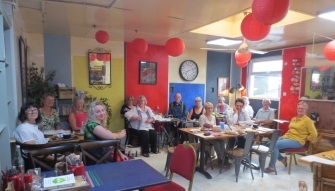 I have been extremely fortunate in the last six years to have the support and companionship of the writing group we started at the Crichton Campus of the University of Glasgow - Crichton Writers - which is an energetic,creative and completely unpretentious group, extremely diverse with many talents. We have produced five anthologies of new work and performed several readings with artists in other disciplines in our regional Arts Festival. 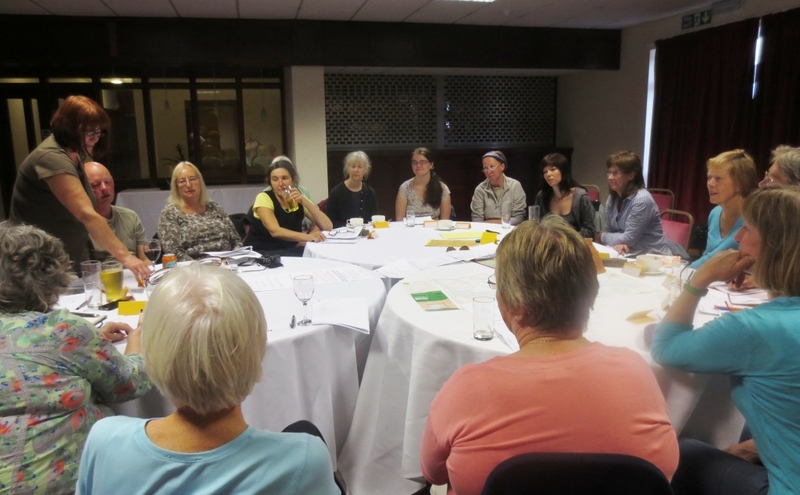 In 2008 I was part of a writing group working on memoirs - not the dusty old colonel kind or the misery kind - one of the group had a chest full of family papers that she was working through. We were talking one day and she said perhaps some of the material might make a drama or a story - would I like to try ? The piece I wrote - 'Marion Terry, who might have been a singer...' is included, with her permission, in this book - all proceeds to 'Medecins Sans Frontieres'. Contact me if you'd like a copy. I'm very keen to support small publishers and bookshops so if you should want to buy any of my books, please do so through this website or the publishers' webpage. Otherwise .... 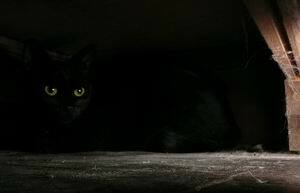 I live with my husand, Richard, and spectacular black cat, Axa (above) in Powfoot, a village on the north Solway shore in Scotland. When I'm not writing I'm a keen wholefood cook - I love bread making - and I'm an early musician with our performing group The Galloway Consort which plays renaissance music in historic locations all over Scotland and the north of England. Richard makes renaissance viols for which he has a healthy waiting list - his workshop is at the bottom of our garden and he hangs his viols on our washing line to absorb ultra violet light from the sun (see Gallery) Sometimes my writing co-incides with our music-making - I have written site-specific historic plays which have been performed with appropriate music in some wonderful locations - Whithorn Priory and Comlongan Castle and we have played often in Alnwick Castle, Edinburgh Castle, Falkland Palace, Stirling Castle and many others.